Was my blog heading enticing? I decided I need to work on them so my posts don't sound so boring. Well I was going to wait and make one whole 'summer crafts' post later on, but I wanted to share this stuff with all 20 of my followers haha! First, I have these cool flowers to show off. They're pretty easy to make, but include some fire. You should just also go check out her blog in general. Emily Jones has great (and pretty easy!) tutorials and just regular blog posts that are pretty interesting. In the tutorial, she says that some fabrics ignite. I found that very vague and was worried I would spend a bunch of money on fabric that just sets on fire. However, I went to Hobby Lobby and got 'Poly-Satin' and it worked just fine. I bought a yard of a few fabrics and do not get a yard! You will not use all of it! 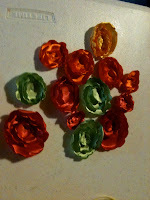 I made some of these flowers for my Dad's girlfriend's daughter's Spanish themed party (mouthful I know). She had tapas, Spanish ham and music and all that jazz. 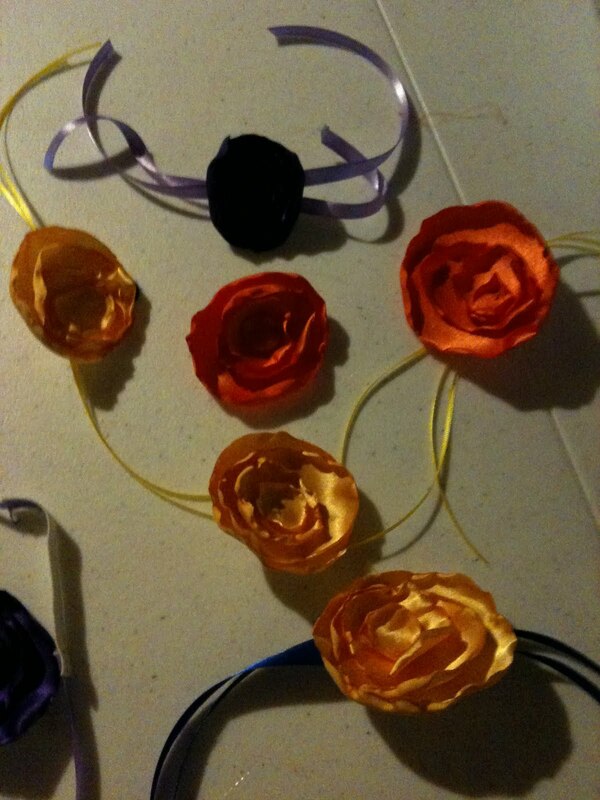 I made the flowers into barrettes and headbands so they'd look like flamenco dancers. The first picture is the barrettes I made. I just attached the flowers and some ribbon to those snap clips from Walgreens with some hot glue. Easy peezy lemon squeezy. 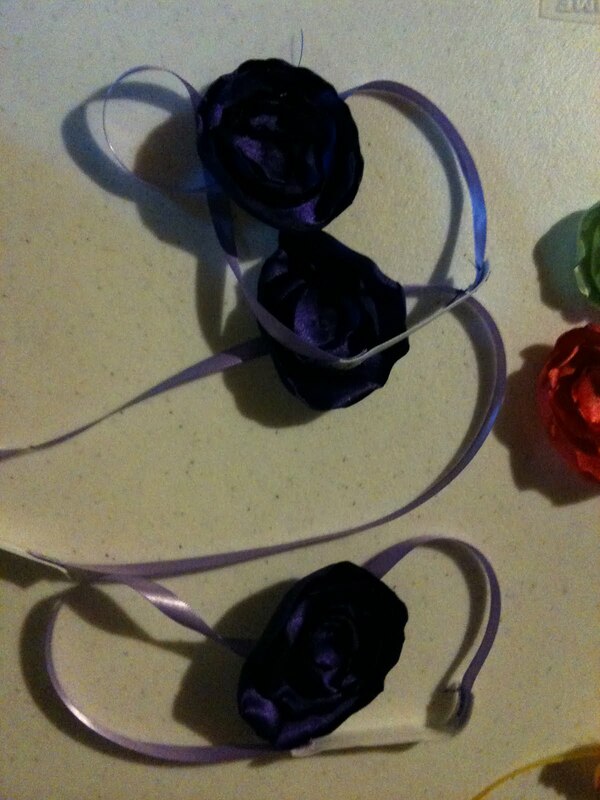 The second picture is the headbands I made. I sewed the flower to a purple ribbon and connected it with a bit of elastic to make it difference sizes. The last picture is just some extras I made for them to put on the food table and make into crafts later. And now on to the more exciting craft! When I was making the shower curtain, my friend Lauren brought over some tote bags with the idea that we could paint/decorate them! I was a bit wary about the idea because those things don't usually turn out that well and look a bit tacky (with rhinestones and what not). We didn't get to the purses that day, but a few days later Lauren came over to plan our trip to Harry Potter World (yes, I'm going! I will be posting lots of pictures of the trip later!) with a tote bag she made it was so cute! She monogrammed it and didn't use rhinestones and it was cute and classy and looked very artsy/professional! Well anyway, she came over today to decorate another one for her boyfriend's mom (points!) and help me make mine. I absolutely loved this one. It looks very refined and like a shopping bag from an upscale boutique, dontcha think? If she hadn't monogrammed it I probably would have stolen it. Now, I am crafty, but I am not very artistic (difference!). I'm probably a little better than most people (mostly because I've taken art camp and classes every since I was seven), but I never took any time to hone or develop any skill I had. And Lauren is very artistic so I was worried mine wouldn't turn out very well, but I think it actually came out pretty dang good, if I do say so myself! Mine was not as perfect as Lauren's. The monogram is too small and a bit off center and I ran out of the paint color on the stripes and made a new one that didn't quite match. You can't really tell in real life, but it really shows in the picture. Anyway, I can go back and fix the monogram by starting over and painting a new one, but I'm not sure if I will. I love the color though and I kind of did it by accident. I was trying for lime green but ended up with this nice sea glass cover and loved it. I bought the rope at Hobby Lobby a few weeks ago and Lauren made the knots. I forgot to explain how we made the tote bags! They're pretty simple, but I realized it might not be obvious. Lauren and I measured and put pieces of tape down to get the lines even and used something circular (I used the tape roll, Lauren used a lotion top) to make the circle. We also both just free-handed our monograms, but drew them with pencil first! Lauren also recommends painting the inside of the circle white so you can go back and use white to fix any messups! Perfect as Lauren's looks, no artist doesn't have a few mess ups! I had lots, but haven't fixed them yet. I told Lauren she should sell them on etsy and I think she might. What do y'all think? 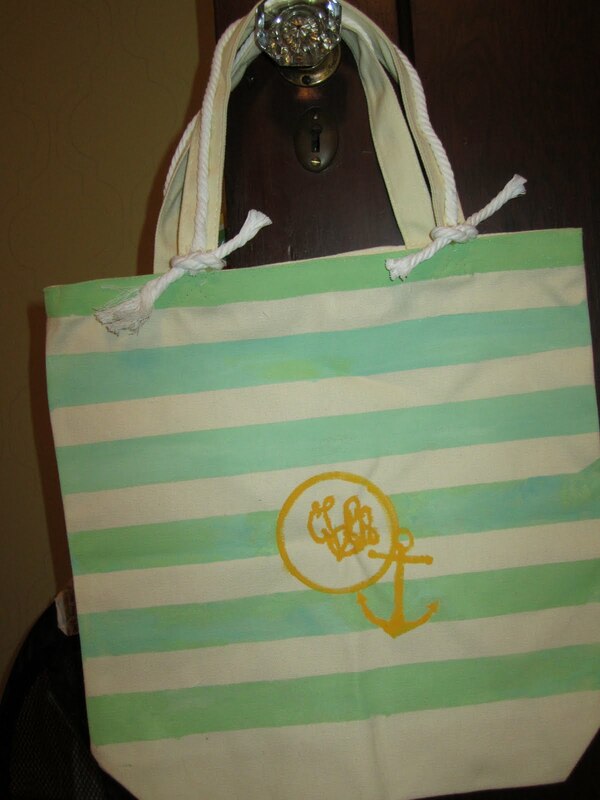 Would you buy one of her bags (I promise the monogram looks better than mine)? What options would you like? Stripes, polka dots, stencils? Love these bags and would order some for bday presents for my sorority sisters that now live far away. Great idea and I just adore your blog! Those bags are SO cute! Thanks for the follow. Can't wait to read more!